E Ink Holdings Inc., a leading electronic-paper (e-paper) developer and manufacturer headquartered in Taiwan, recently announced that it is supplying the E Ink Mobius display to Rimowa of Germany, the maker of the iconic line of ribbed, pricey aluminum shelled luggage often promoted with chic imagery. Frank Ko, chairman of E Ink, says that the applications of e-paper will continue to broaden in daily life, as such display features many advantages over other technologies, such as zero power consumption during static display mode, long preservation of displayed contents etc. The steadily rising popularity of smartphones, he added, will only expand the range of application of e-paper as the handheld device handles more apps to transmit increasingly more content. Rimowa and and its airline launch partner Lufthansa just presented the Rimowa Electronic Tag the first time in Las Vegas at FTE Global (Future Travel Experience), the airline industry's leading conference. The product is a result of the BAG2GO project, the cross-industry collaboration between T-Systems, Airbus and Rimowa that has already attracted great interest worldwide, leading to the founding of a wholly-owned subsidiary of Rimowa in 2014 with the name BAG2GO GmbH. The first digital and fully integrated mobility solution for luggage makes flying with baggage more convenient, faster and more secure. It consists of a Rimowa suitcase, an airline app and the Rimowa Electronic Tag with an E Ink Mobius display, which is built into the luggage. A predicted 3.5 billion people will travel by plane this year, almost all of whom already carry a smartphone in their bag or pocket; so it is only logical to connect suitcases to the digital world. Despite the ubiquity of electronic handheld devices, luggage is still checked in by hand before a paper label is attached. In contrast, air passengers with the Rimowa Electronic Tag can simply check in from home or while on the road using the airline app - and check in their luggage, too. In addition to a digital boarding pass, passengers will receive digital luggage information from the airline for their booked flight. Lufthansa recently became the first company to integrate this feature in its app as part of an exclusive arrangement. Just by one click the luggage information is then sent via Bluetooth from the smartphone to the suitcase equipped with the Rimowa Electronic Tag. The details are immediately displayed on the built-in data module powered by E Ink. Such process enables passengers to drop off Rimowa suitcases at airports without having to wait in-line as usual for conventional check-in and paper tagging. 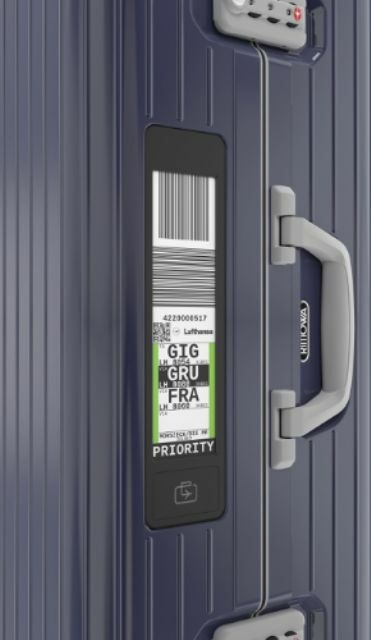 In terms of size and appearance, the luggage information displayed on the electronic data module corresponds to today's paper labels, including the green EU (European Union) stripe required by customs (compulsory for all flights departing from European airports). This makes the transition from analogue to digital very simple. The important information is protected from moisture, heat, cold, shocks and vibration and cannot be accidentally torn off, unlike a paper label. Rimowa and Lufthansa have been presented with the 'Best Baggage Initiative' award. As part of a gala evening at the FTE Global show (Future Travel Experience) on September 10, 2015, Rimowa and Lufthansa received the award for the Rimowa Electronic Tag. The annual prize ceremony recognizes companies for modern ideas and services that make traveling even more enjoyable for passengers - both on the ground and in the air. An anonymous panel of industry experts awards the most innovative, demanding and successful initiatives and organizations. E Ink stresses that the size and shape of the Rimowa Electronic Tag are the same as existing luggage ticket, and the displayed information on the e-paper display are not affected by humidity, temperature, shock and vibration; while the electronic tag can not be torn off.